This season’s first San Francisco shark trip of 2017 is set for Saturday, September 30th. 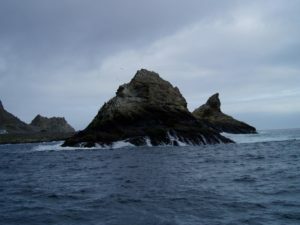 Shark divers will depart for the Farallones before dawn, aboard the Derek M Baylis, a special 65 ft sailboat, custom built for offshore research and education. The trip to the feeding grounds for adult white sharks can take about three hours and reaching the islands often requires braving rough seas. During to the trip to the Farallones, trip participants learn about the Sanctuary and white sharks from a certified sanctuary naturalist. The morning briefing also includes tips for spotting signs of shark activity, both from the cage and the vessel’s observation deck.